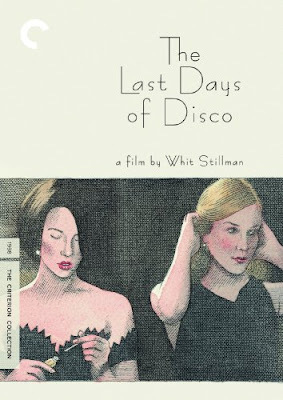 Discussions Magazine Music Blog: THE LAST DAYS OF DISCO: The Criterion Collection DVD! THE LAST DAYS OF DISCO: The Criterion Collection DVD! THE LAST DAYS OF DISCO: The Criterion Collection is now available on DVD and is certainly a feast for the eyes.. which is just what we expect from Criterion!! The Last Days of Disco (1998) brings to a close American cinema raconteur extraordinaire Whit Stillman’s unofficial trilogy about the neuroses of the young and upscale. Following Metropolitan and Barcelona, this is a clever and sparkling return to the nighttime party scene in early '80s Manhattan. At the center of Stillman’s roundelay of revelers are the icy, commanding Charlotte (Kate Beckinsale) and the demure, pragmatic Alice (Chloë Sevigny), by day toiling as publishing house assistants, and by night looking for romance and entertainment at a premier, Studio 54–like club. Brimming with Stillman’s trademark dry humor, The Last Days of Disco is an affectionate yet unsentimental look at the end of an era.